The SPX certainly paints a better picture than when we looked at it back on the 15th Jan for the rollover. Although, the Y ratio bandwidth is considerably thinner, it is still absolutely massive. Currently, it stretches from 2495 all the way up to 2670, which is, naturally, where this index came to rest last Friday, being closed Monday. So, it is still 175-points (6.6%), and this seems to be the way of it these days, as just having a 1% to 2% Y ratio bandwidth is but a distant memory. Therefore, it will be a real test of this index today, whether it wants to take on the R ratios from the off, or take advantage of this huge bandwidth. Nice to see a start to a new expiry begin with it all to play for, and worth noting is the very decent level of activity, which means a respectable degree of engagement. Sadly, we never did the rollover for the NDX. This means our last coverage was way back on the 8th Jan and considering Y2 then didn’t kick in until 7125 we are not really surprised by what happened. Although we have no idea how the tail end of the last expiry developed, if indeed it did at all, but we do recognise that what we are seeing here is exactly the same as what we saw this time last expiry. So, don’t take those ice-skates off any time soon. Perhaps worth noting that the intraday high on Friday was 6816.23, so they may well already have an inkling of where Y2 in Feb is. In the Jan expiry just gone the SPX got its way on the rollover Wednesday, which left the DJX here, free rein for the actual expiry. Suffice it to say the zone in both Jan and Feb have not changed, and the settlement price on Friday was 24574, so we would say spot on really. 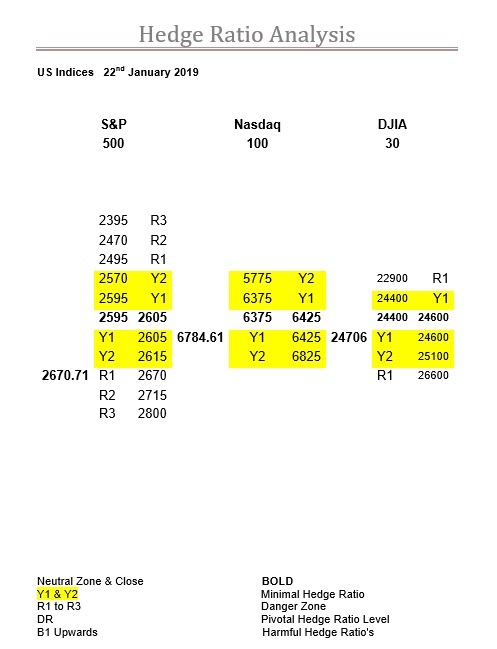 Who would have thought, that after all that trouble getting over 24100 and back into their Y ratios, that they would eventually succeed come the expiry, so bravo the DJX. Despite the level of activity, sadly here the benchmark is so low anything looks good, there has been little change in the ratios since we last looked. In fact, the ratios are so thin, the zone could actually stretch from 23900 all the way up to 24600. Therefore, for this expiry, 24600 is a really key level. Unless the ratios start getting populated this is going to be a real rollercoaster ride this expiry, so either hang on tight or sit back, enjoy, and wave those hands in the air.